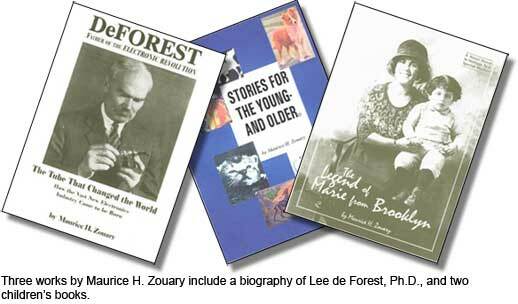 Maurice Zouary plans new book about Lee de Forest, Ph.D. He probably is the last surviving member of the DeForest Pioneers, Maurice Zouary is. In the 1950s, two organizations sprang up within a year of one another to memorialize and perpetuate the names of two inventors of electronics technology that shaped the world of radio, today also known as wireless communications — and including radio and television broadcasting. First, admirers of Lee de Forest, Ph.D., started the DeForest Pioneers, and soon thereafter, admirers of Maj. Edwin H. Armstrong formed the Armstrong Memorial Research Foundation. Armstrong and de Forest were at odds with one another over their inventions. They also headed rival societies. 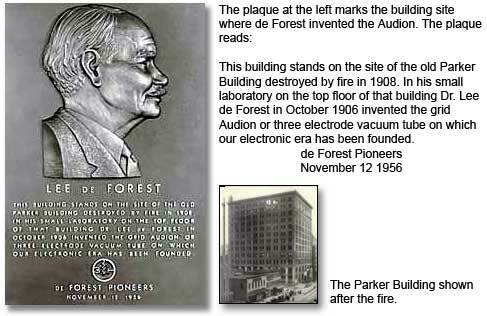 Born Aug. 26, 1873, de Forest served as president of the Society of Wireless Telegraph Engineers in his 30s. The Society was founded in 1907, two years before RCA. He became a charter member of the Institute of Radio Engineers (IRE) when it was formed in a merger of the Society with the Wireless Institute. He served as IRE president in 1930. Born Dec. 18, 1890, Armstrong joined RCA in 1912 and served as its president from 1916 to 1921. He gave RCA additional service as a director for another 20 years or more. The DeForest Pioneers merged with RCA in 1983. Nearly inactive, the Armstrong foundation is in a diminished condition. Its acting president told me last year that it retains a scholarship endowment of about $150,000. The bulk of de Forest’s and Armstrong’s contemporaries have passed away. Some the inventors’ admirers who belong to RCA remain active enough that the Club hears from them whenever it publishes something that exalts the memory of one of the two inventors in a way that could be perceived as prejudicial to the other. Maurice is a biographer, booster and defender of de Forest. 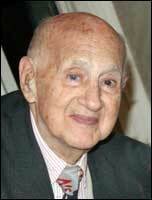 His work in documenting the man’s inventions and technical achievements is extensive. At the top is Maurice’s book, “DeForest: Father of the Electronic Revolution.” The book emphasizes work that consequently brought de Forest, Armstrong and other inventors into disputes. 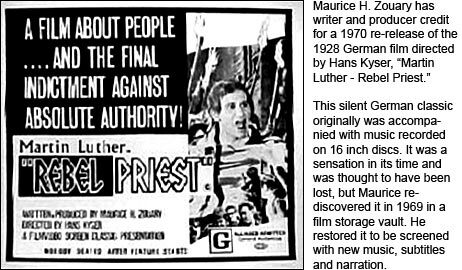 Maurice is rewriting his book to widen its appeal, and he told me that he would like to see the work dramatized as a movie. Maurice is no stranger to Hollywood. His company, Movietronics Corporation of America, has a large collection of movies that Maurice has supplied for television broadcasting and other purposes. The new book that Maurice is preparing has the working title “The New History of Motion Picture Sound.” It emphasizes de Forest’s invention of sound-on-film technology, something that Hollywood might understand better — and that book readers might find more interesting — than some of de Forest’s other inventions. What does true recognition mean to the entire motion picture industry, and especially to those who seek careers in film and want to know the foundations of its history and the people who made important contributions? We know that George Eastman reportedly made the physical motion picture from plastic strips; we know that Edison reportedly invented the mechanism that made the motion picture work. These historical realities, these events that launched the motion picture as a durable entertainment medium, cannot be changed. Lee DeForest provided the key to what made sound work in the first place: the electron tube amplifier. He pursued the task of making sound filmworthy, and he had succeeded by 1922. As a result of my numerous early published articles and extensive personal appearances exhibiting Phonofilms on television and in auditoriums and colleges, the government finally recognized DeForest’s pioneering work. My efforts have also triggered the search for missing Phonofilm productions — something like an archaeological hunt for lost treasures. It has been enormously gratifying to see the fruits of my crusade for DeForest. Veteran industry people have expressed their congratulations on my revelations. “It was long overdue,” some said. “We have always known DeForest was cheated out of his rightful position as the inventor of sound-on-film talking pictures in the early 1920s” Noted authors have taken up the case for DeForest by including in their books a recognition of DeForest as they pioneer inventor who brought sound to the motion picture. We can only hope that through this book and others, future scholars and historians will be provided with a true perspective of the events that occurred between the years of Thomas Edison and “The Jazz Singer,” and the part that DeForest played in making them happen. The invention of motion picture sound belongs to Dr. Lee DeForest. What great men do cannot be ignored. For many years, Maurice made it his business to find older films, usually early sound films, and acquire the best copies along with television broadcast rights. His company, Movietronics Corporation of America, supplied TV stations with films for rebroadcast. Maurice conducted some of the business under the name Filmvideo Releasing Corp. This entry was posted on Sunday, May 20th, 2007 at 3:01 pm and is filed under RCA news. You can follow any responses to this entry through the RSS 2.0 feed. You can leave a response, or trackback from your own site.